As an eighteen-year-old I just loved Bonjour Tristesse, and I remember being passionately on Cecile’s side. These days I might view it a bit differently…. I can imagine that! It’s funny – in some ways I could see the story from both sides, but even so I did feel for Cécile. I’m going to give my goddaughter a copy of this book to read as part of a future birthday present. She’ll be sixteen next year, probably a good time for her to read it. I am fully expecting her to be behind Cécile! Lucky girl to have such a fairy godmother. She is quite difficult to buy for right now as she’s at that age where her tastes change from one day to the next. Nevertheless, I’m hoping Bonjour will hit the right spot. Jacqui, caught up with this cool little entry (even though summer is pretty much at an end here, except for the muggy super-hot weather). I was reminded of Ray Bradbury. I read “The Martian Chronicles” and “Dandelion Wine and Other Stories” the summer I turned 16 and they were quite magical. They are still great, but I think Bradbury’s great for teens. I think your goddaughter may like them a lot…. Oh, it’s rather humid here right now as well! We could do with a drop of rain to clear the air. Bradbury’s a great suggestion – I read him when I was in my twenties, but even so I can see how he would appeal to teens too. I shall add him to her list – thanks. Thanks, Gemma. Isn’t it just the most delectable summer read? I seem to recall you mentioning the sensual nature of Sagan’s prose in your review, which is spot on – it’s a very evocative novel on more than one level. I may well do another brief post on the translation, maybe later this week if I have time. It’s interesting to see that we read the same version while Claire and Max went with the Irene Ash…I’ll come back to this later in the week. It is! Yes, I love the prose in this novel and, like you say, it’s very evocative. That is interesting about the editions – for me it was completely unintentional as I didn’t realise there was more than one translation. I’d be interested to read the Ash translation just to compare. Well, I think that’s what I’ll be doing at some point! My (brief) post on the translations should be up by the end of the week, so I’ll say a little more about it then. Great review, Jacqui. I read and reviewed this one in my early days of blogging and recall being quite shocked by it. My impression was that Cécile wanted to keep her father to herself, hence her devilish plan. Wonderful review of a perfect little gem. I love this novel. Thanks, Ali. Glad you enjoyed it too. I can’t believe it’s taken me this long to get around to reading it! I can see how the world described would seem like paradise to an adolescent and how alienated one be towards someone who threatened it. I can see also see how such a situation could lead to great fiction. It’s a really interesting book from a moral standpoint as the dynamics are actually quite subtle in spite of how they might appear at first sight. As Gert mentions above, I suspect one’s sympathies may vary depending on age and level of life experience at the time of reading. In some respects it’s easy to blame Cécile, but then again one could argue that Raymond has failed her in his duty as a ‘responsible’ parent. It would make a great choice for discussion with book groups. I have this on the wish list – glad it is going to live up to my expectations…..
Oh, terrific. Yes, plenty to look forward to here. It’s an interesting one from a psychologist POV. Hope you enjoy. Reading both your and Claire’s reviews has convinced me I should read this again, particularly given your reference to The Go-Between of which I’m very fond. This is on my ‘I really must read’ list along with many others. The way her life changes from a carefree existence to a more structured one is just like the ‘end of summer holiday’ feeling; it also made me think of the excellent Bergman film ‘Fanny and Alexander’. Well, it’s definitely worth making time for this one. Yes, there’s a definite ‘back-to-school’ feeling about the translation from the lazy days of summer to the kind of structured existence Anne attempts to impose on Cécile (and on Raymond too for that matter). I haven’t watched the Bergman for years so I’m due a refresher – thanks for the nudge! I’ve been after reading this for ages but am going to choose the edition carefully, I think. Did you see Rachel Cooke’s piece in The Guardian on the variation in translations? I did! That’s partly what I’m planning to cover in my thoughts on the translation. If I get time, I’ll post a brief piece about it later this week. There’s are pros and cons to both versions, but I’ll try to say a little more about these in my post. Great review Jacqui. I read this a while ago and remember being drawn in by the hypnotic twists and turns and the underlying sense of manipulation throughout. But it’s a long time since I read it. I agree it seems a very accomplished book for such a young woman. Thanks, Belinda. Yes, hypnotic is a good way of describing the mood of this one. The sense of manipulation and focus on the physiological remind me a little of some of Patricia Highsmith’s novels. A sort of evocative, summery version of one of her magnetic stories. Glad you were drawn it by it too. I read this many years ago (in French) and I tell myself I’ll reread it one day. I remember really enjoying it at the time, but it’s been decades. Good point. I know the book floored me at the time but who knows these days? Great review as always Jacqui! I read and reviewed this a while back in the older translation, which I very much loved. It’s such an evocative story, though I suspect from my reading of her other books she may have peaked early…. Nevertheless, I had picked up on some of the translation issues being mentioned, so I’ll look forward to what you have to say. I think I would have felt very differently about the book had I read it when I was younger – now I feel much less sympathetic towards Cecile than I’m sure I would have! Oh, I’ll take a look at your review, Karen. I do recall you posting on another Sagan, but I may well have missed this one. I’ll drop by when I get a chance. Yes, I can appreciate how readers’ reactions towards Cecile might change over time. I suppose I was trying to see the situation from more than one side. While it seems natural to point the finger at Cecile, I feel Raymond must shoulder some of the blame for failing in his role as a parent. There was no sense of any moral framework or guidance influencing Cecile’s actions until Anne appeared on the scene, so things were bound to get messy as soon as the dynamics changed. It’s a great read, though – glad you loved it too! As for the translation, I’ll try to post a few thoughts on it later this week – just a short piece as long as I find the time. My edition also contains A Certain Smile, which could be the one I recall you reviewing. I’ll definitely read it but will lower my expectations accordingly in light of your comments on Sagan peaking early. What a shame as I was hoping for another delectable page-turner! I bought this fairly recently (I’d hope to read it this month but, as usual, I’ve been too ambitious). The Penguin Classics edition comes with another story (A Certain Smile) – did you read that? Not yet. It’s on my Classics Club list (partly to encourage me to make headway with Sagan) so I hope to read it next year. Maybe I’ll pencil it in for the summer! I suppose I avoided reading Bonjour Trieste because it was written by an 18 yeasr-old girl and have avoided Francoise Sagan because that was her most famous work. I couldn’t imagine an 18 year odl doing anything important. It’s petty impressive stuff for an eighteen-year-old. I wish I’d read it as a young girl as I’m sure it would have knocked me sideways in my youth. Even so, it’s well worth reading at any stage in one’s life. Such an evocative read for a sunny afternoon. This has been on my list for so long, it’s embarrassing. I think your review has finally given my the push to bump it up! I didn’t know the author was 18 when she wrote it. Incredible success for someone so young. That’s good to hear! Well, by rights I really have should read this as a teenager, but better late than never. It’s such a great story, very poised for the work of an eighteen-old-year. It made curious about Sagan’s own life, what she had experienced before writing the novel and the source of her ideas for the story. There’s a little bit about it in the intro to the latest Penguin edition, but it would be interesting to discover more. I love Françoise Sagan. It’s an amazing book for an eighteen year old writer. I’ve read several of her novels and I was never disappointed. She’s such a good reader of people. I’m looking forward to reading your post about the translation. I read it in French, of course but I’m curious about the English translation anyway. Oh, brilliant. That’s great to hear as I was a little worried when Kaggsy said she thought Sagan may have peaked a little early. Yes, her understanding of the complexity of emotional dynamics at play is pretty astonishing for an eighteen-year-old. I love the way she gives us access to Cecile’s inner thoughts and reflections – such subtlety on display here, especially in this element of the narrative. My post on the translation has just gone live. Basically, I think I need to read the Irene Ash translation to see how it compares. Both versions seem to have their own pros and cons. As a slight aside, have you ever read anything by the Belgian writer Madeleine Bourdouxhe? Her novella, Marie, shares some similarities with the Sagan, another evocative story set in France. Bourdouxhe hung out with Jean-Paul Sartre, Simone de Beauvoir and Raymond Queneau in the literary cafes of Paris back in the day. I think you’d find her of interest if you haven’t read her already. A brilliant review of what sounds like a delightful read – having been so taken with The Go-Between this is going on my list straight away, I’m dying to know what plan Cecile hatches – thanks for sharing your thoughts Jacqui and bringing this book to my attention. You’re very welcome, Cleo. It’s a wonderful novel, and I’m pretty sure you’ll enjoy it too. It captures that hazy, languid feeling of a glorious summer rather perfectly. A very evocative read for this time of year. I went through a major Françoise Sagan phase and m ust have read at least a dozen. They were all good. Mind you, I was very young, much younger than the writer when I read her. Still, I’m pretty sure I would still like her. I really wish I had discovered her many years ago. She feels like the perfect writer to read as a teenager or young girl in her twenties. Still, better late than never! I’d like to read A Certain Smile, too – well, it’s on my Classics Club list, so I hope to get to it next year. To be honest, reading her so young wasn’t ideal for me. 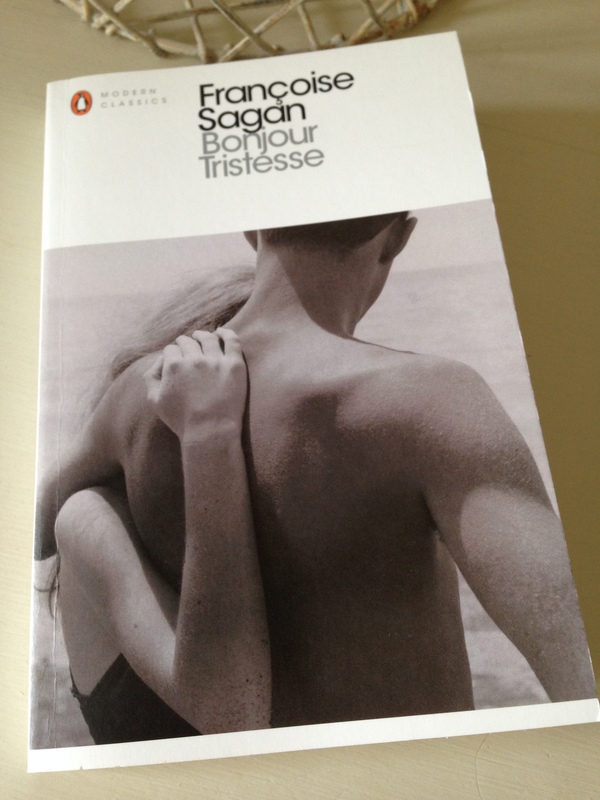 Bonjour Tristesse was OK but the later works paint such a depressing picture of love. My favourite was Aimez-vous Brahms? which has been made into a movie with Anthony Perkins. Ah, right! I can understand that. I was thinking of giving my goddaughter a copy of this book as part of her next birthday present. She’ll be sixteen next year, which should be fine for this one. I think she’ll like it, but it’s really useful to know about the others – at least I can warn her if she takes to Sagan. Oh, and I’ve made a note of Aimez-vous Brahms? Thank you. It really is excellent isn’t it? I’m glad you liked it, but not remotely surprised. It’s remarkable how elegant a novel it is given how young Sagan was when she wrote it. Right, I’m off to read your translation piece. Yes, it’s brilliant. Another contender for my end-of-year list – but then again I’ve read so many wonderful books this year I may well have enough ‘highlights’ for two round-ups, an embarrassment of riches so to speak. Returning to the book for a mo, I couldn’t help but think of your review when I came to the passage where Cécile has the orange and a cup of scalding hot coffee for breakfast. Even though I hadn’t revisited it before reading the book, your quote from that section must have stuck in my mind as I recognised it immediately. Your comparison with Les Liaisons Dangereuses was spot on too. There’s definitely an element of Cécile playing with other people’s emotions with little regard for the consequences. The way she leverages all those emotions was quite something. What impressed me most though was the insight Sagan gives us into Cécile’s inner thoughts. This element of the novel turned out to be far more subtle and sophisticated than I had expected, especially from an eighteen-year-old. It made me curious to read about Sagan’s life at some point, to learn more about her own experiences in those early years. Anyway, a marvellous book – so glad I finally got around to reading it! Oh, and many thanks for your comments on the translation piece too. I’m in between various appointments right now but will reply a little later once I get a chance.